During a battle with Cicada, Nora is severely injured. Due to Cicada's dampening powers, Nora's speed healing isn't working, leaving Barry and Iris scared for their daughter's future. Meanwhile, Killer Frost keeps interfering with Caitlin's work on the meta-cure. Well, it's sweet that Frosty and Caitlin are on good terms and can even talk to each other. Should I be afraid to ask how Frosty got that sample though? Probably. Gee, yeah, it seems like a bad idea to get all the metahumans Cicada wants to kill all together in one place. Sigh. Why is Ralph the only one in a room full of geniuses who is smart enough to bring a ranged weapon that doesn't rely on meta powers to fight Cicada? Somehow, they never address how that helicopter is going to land now, do they, even though they specifically state it can't land, causing Ralph to rescue the metas (by placing them into a helicopter than can't land). I swear the stupid and the (bad kind of) silly in this show gets stronger and stronger with each episode. It's past time for Cicada to go. I remember reading months ago that the show was going to have mini-arcs this season, implying that Cicada would've been dispensed with by the mid-season break in December, but he's still dragging on. 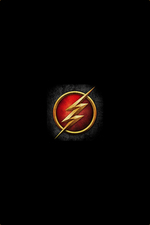 Eobard Thawne is waiting in the wings! Bring him on already! "The helicopter can't land! Quick, everyone, get in the helicopter!" I just have to laugh at such nonsense but, jeez, couldn't they have put in a throwaway line about Ralph getting everyone off safely, or that they did a safe emergency landing? What are the odds of Barry & Co. turning Grace into a meta when they try to heal her? > What are the odds of Barry & Co. turning Grace into a meta when they try to heal her? 100%. I'd put my money on her already being a meta and it having something to do with her condition. Maybe the doctor knows she is a meta and is keeping her down to manipulate Cicada. Should I be afraid to ask how Frosty got that sample though? She got it from the ice shard she used to cut Cicada during their fight. Because Killer Frost basically told everyone she can take him on like last time, and she did. The dumb part is actually when they decided to bring out Caitlin to play field doctor when Nora and Ralph could've just carry the woman out of the dagger's dampening field and then have Nora rush her to a hospital. They also never addressed that a helicopter without landing gears can still hover just low enough for people to climb on and off. I thought this was a decent episode. Injuring Nora was a good way to get Barry to be mad enough for things to unfold, even though how she got injured was not well thought out. I would've written it where the team had to split up and Nora and whoever only had the cold guns, which Cicada disables with his ground slam energy wave and knocks them back then goes to injure Nora but Frost shows up and he runs before he could kill her. The Sherloque thread is leading to Thawne so we'll probably see that plays out next episode.